Please note the usual disclaimer applies that everything in the future is subject to change. 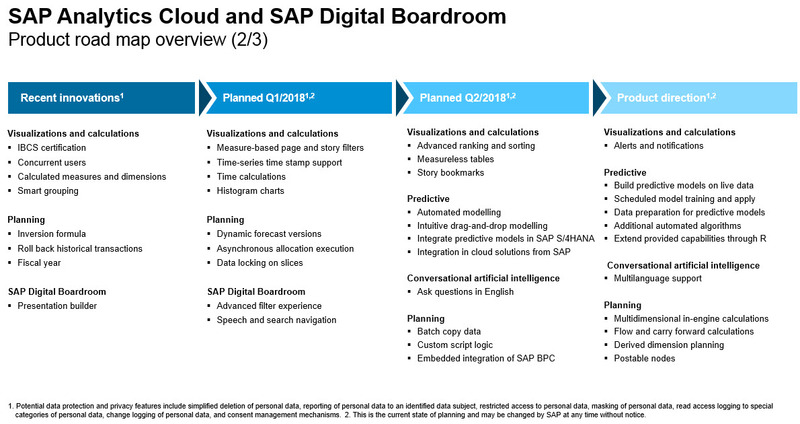 Here we will discuss topics, such as creating stories, creating visualizations, calculations, data blending and also the consumption workflows. 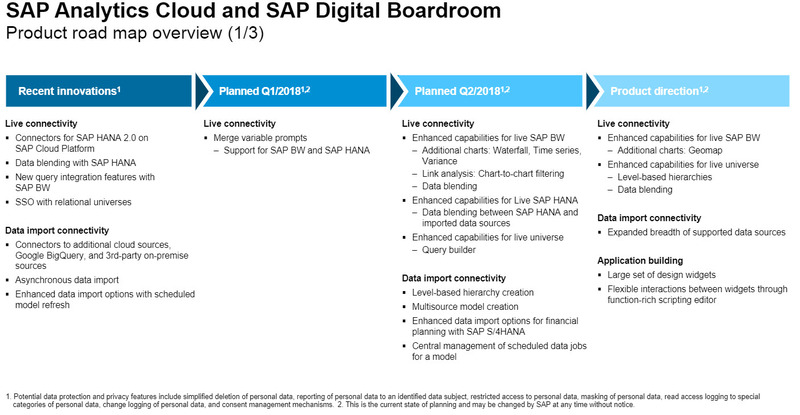 Here we will discuss the ability to connect to live data, load data into the cloud and we will discuss the topic of data modeling. 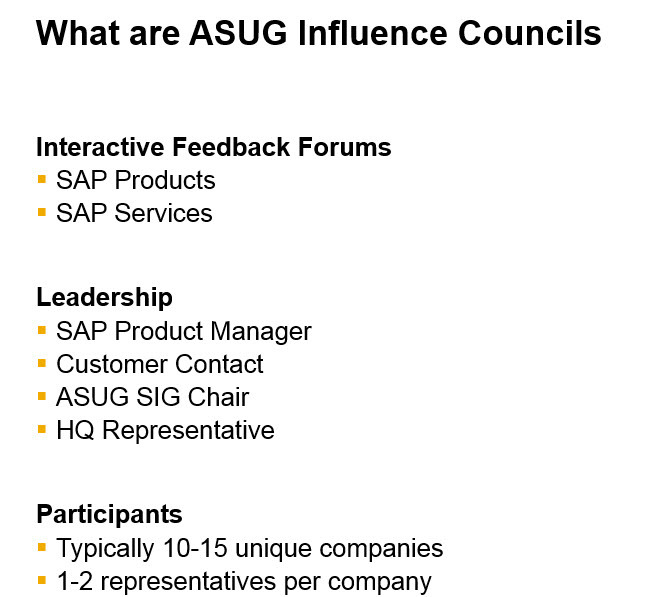 Influence Councils are interactive forums where members can communicate ideas and concerns about product plans and SAP services directly to SAP development and product managers. It is also an opportunity to network with other members. Each Influence Council has a leadership team that manages activities. 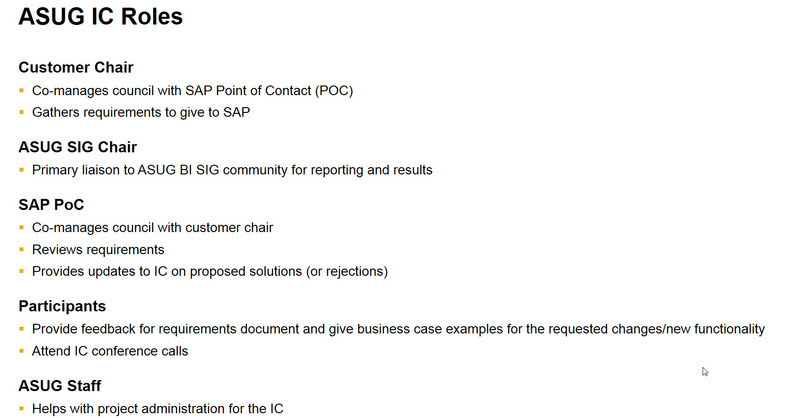 This team is comprised of the Product Manager, Customer Chair, ASUG Volunteer SIG representative and HQ representative. 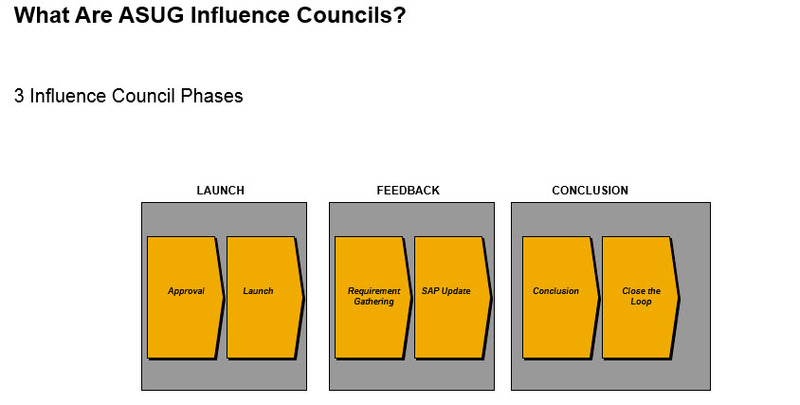 Generally, Influence Councils have 3 phases: Launch, Feedback and Conclusion. In each phase, a set of activities occur. Please see high level council charter above. 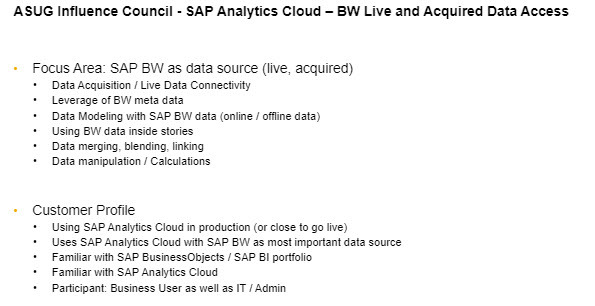 Q: “Classic” BW on ECC…or Embedded BW in S4HANA..or both welcome..? 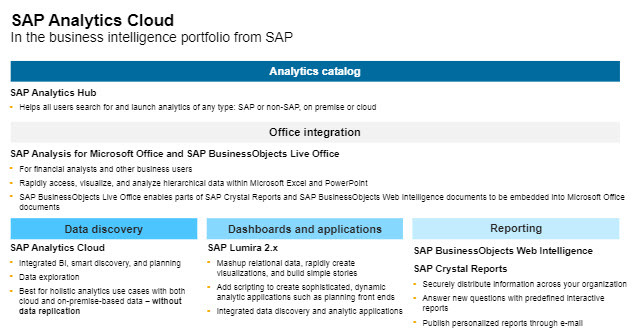 Q: Is Design Studio/Lumira Designer still being ported to SAP Analytics Cloud? A: no migration path at this time; wait until SAPPHIRENOWQ: 3rd party Infrastructure Support for AZURE needed ASAP…Please. thx! 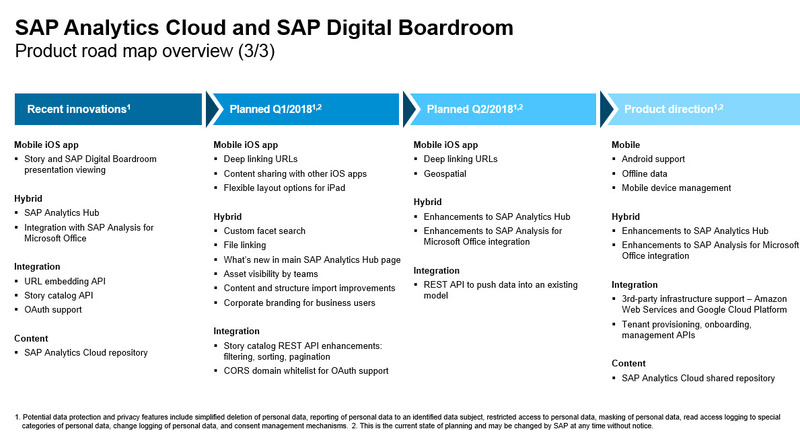 A: Not on the roadmap – feel free to add to Influence site: https://influence.sap.com/sap/ino/#/campaign/884Q: Where can I find list of influence councils? 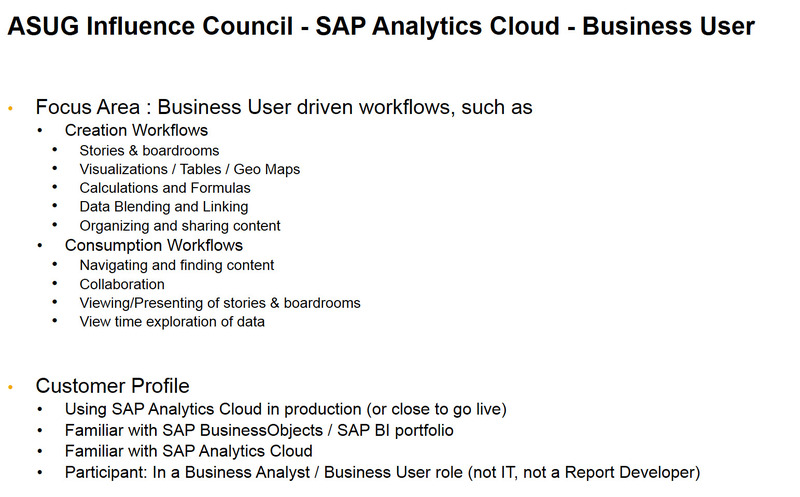 Q: Do you have any plans to integrate with SuccessFactors? 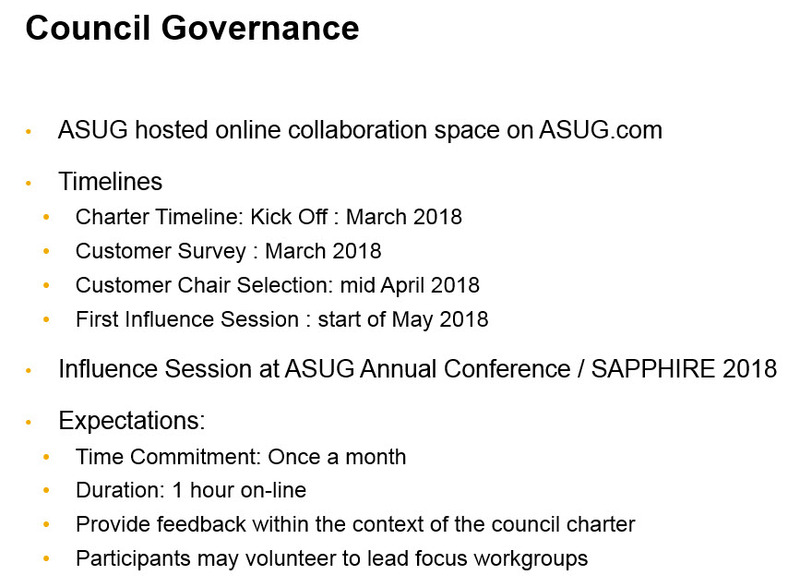 If you are interested, you must be an ASUG member. You can only select one influence council to join as well. If you are interested please complete the survey here.